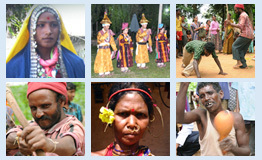 The Toda language is a member of the Dravidian family. The language is typologically aberrant and phonologically difficult. Linguists have classified Toda (along with its neighbour Kota) as a member of the southern subgroup of the historical family proto-South-Dravidian. It split off from South Dravidian, after Kannada and Telugu, but before Malayalam. The Toda people are a small pastoral tribal community who lives on the isolated Nilgiri plateau in hill country of Southern India. The Toda traditionally live in settlements called mund, consisting of three to seven small thatched houses, constructed in the shape of half-barrels and located across the slopes of the pasture, on which they keep domestic buffalo. Their economy was pastoral, based on the buffalo, which dairy products they traded with neighboring peoples of the Nilgiri Hills. According to M. B. Emeneau in 1984, the successive decennial Census of India figures for the Toda are: 1871 (693), 1881 (675), 1891 (739), 1901 (807), 1911 (676) (corrected from 748), 1951 (879), 1961 (759), 1971 (812).The Toda dress consists of a single piece of cloth, which is worn like shalya wrap over a dhoti for men and as a skirt for women along with shalya wrap. The Toda Tribe of Nilgiril Hills are pastoral people. They rear buffalo’s arid produce, different milk products, like ghee, cheese, butter, curd which they sell or exchange with the different products of the neighboring tribes to procure the things of their day-to-day use. The dairy works are absolutely the males’ business. Females are debarred from entering the dairy house even. Previously, males were engaged in cooking but now this duty has been shifted to the female inmates of the house. They are also assigned such duties like, the rearing of children, fetching of drinking water, and fuel from the jungle. Milking, churning, etc. are male’s jobs. They milk their buffaloes twice a day i.e. in the early morning and also in the evening. They once practiced fraternal polyandry, a practice in which a woman marries all the brothers of a family, but no longer do so. All the children of such marriages were deemed to descend from the eldest brother. The ratio of females to males is about three to five. The culture historically practiced female infanticide. In the Toda tribe, families arrange contracted child marriage for couples. Toda religion is marked by polytheism, as they believe in an indefinitely large number of spirits, gods and goddesses. Of these, two are most important – Teikirzi and On. The former one is the goddess who has over-all command on the people and land. The latter is a male deity, supposed to be the brother of the former, who rules the world of the dead. Transmigration of soul is typically present among the Toda. The soul is indestructible and often takes rebirth. Toda religion features the sacred buffalo; consequently, rituals are performed for all dairy activities as well as for the ordination of dairymen-priests. The religious and funerary rites provide the social context in which complex poetic songs about the cult of the buffalo are composed and chanted. Fraternal polyandry in traditional Toda society was fairly common; however, this practice has now largely been abandoned as was female infanticide. The forced interaction with other peoples with technology has caused a lot of changes in the lifestyle of the Toda. They used to be primarily a pastoral people but are now increasingly venturing into agriculture and other occupations. They used to be strict vegetarians but some now eat non-vegetarian food. At presently an attempt is made to document Toda grammar, Toda English-Tamil dictionary, basic core vocabulary and Ethonolinguistics profile is in progress.